Specially formulated with Chamomile Oil for skin prone to dryness, redness and irritation. Suitable for all the family including newborns. 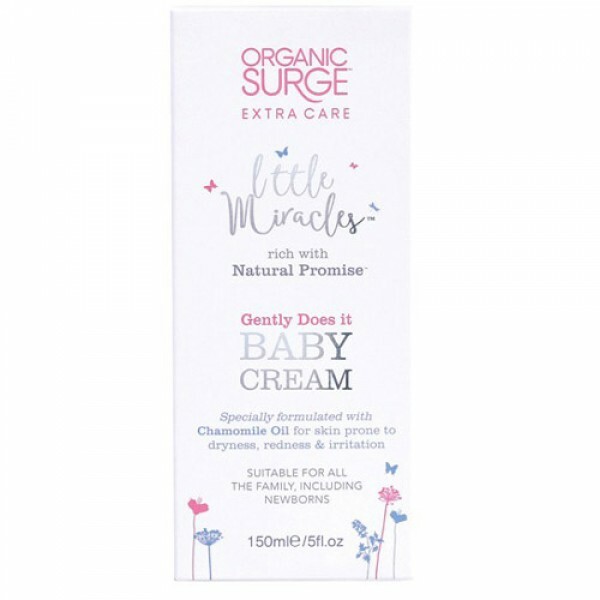 Organic Surge Little Miracles Gently Does It Baby Cream loves your baby's skin as much as you do, keeping it as soft and gentle as the day they were born. This gentle plant infused formula of organic lavender, aloe vera, chamomile, shea butter and cocoa butter makes it safe and effective for delicate new skin. 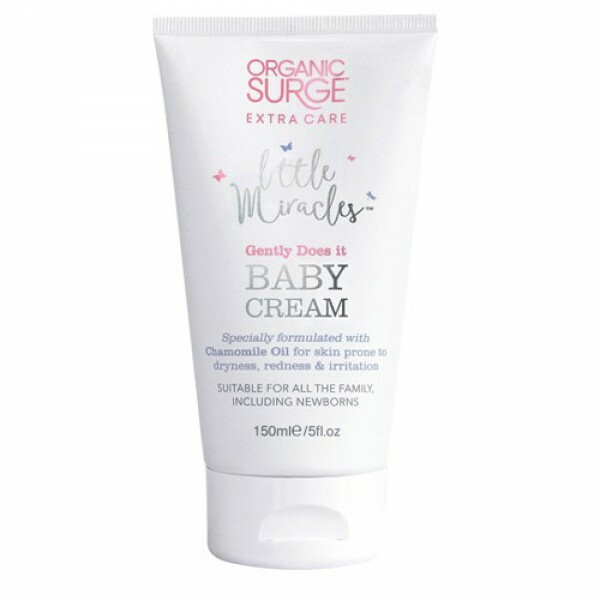 Formulated with German Chamomile Oil to create a multi purpose cream which feeling soothing and helps to protect against the cause of nappy rash. Spread this cream with its soothing feel onto any area that needs moisturising and nourishing. 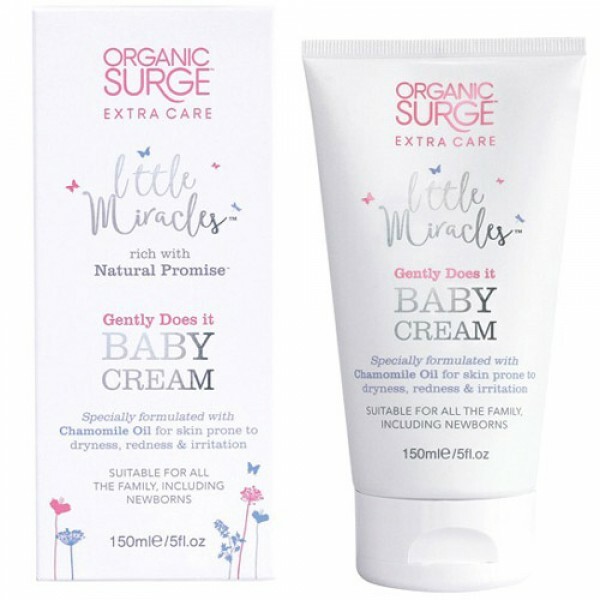 Organic Surge products are always made to be kind to sensitive skin and are 100% free of harsh chemicals. You’ll find no parabens, sodium lauryl sulphate, no artificial fragrances or colourants and no genetically modified ingredients in any organic surge products. 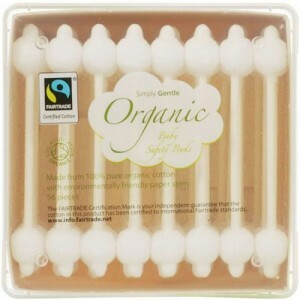 They offer great value for money too and most products in the range are certified organic by Ecocert. Chamomile, Aloe Vera, Shea Butter, Cocoa Butter. Aqua (Water), Glycerin**, Stearic Acid, Glyceryl Stearate SE, Butyrospermum Parkii (Shea) Butter*, Cetearyl Alcohol, Theobroma Cacao (Cocoa) Seed Butter*, Cetearyl Glucoside, Benzyl Alcohol, Aloe Barbadensis Leaf Juice Powder*+, Chamomila Recutita Flower Oil, Lavandula Angustifolia (Lavender) Oil*, Linalool, Dehydroacetic Acid, Sodium Hydroxide, Cetyl Alcohol, Stearyl Alcohol, Citrus Grandis (Grapefruit) Seed Extract*, Geraniol, Potassium Sorbate. * Ingredient from Organic Farming. **Made using organic ingredients. Product colour or texture may vary slightly due to natural ingredients. Store in a cool dry place, out of direct sunlight. Avoid contact with eyes. If product gets in eyes, rinse immediately with plenty of warm water. Keep out of reach of children. + PROVIDES THE EQUIVALENT OF 71% ALOE VERA GEL Certified by ECOCERT Greenlife according to ECOCERT standard available at http://cosmetics.ecocert.com. 98% of the total ingredients are from natural origin. 83% of the total ingredients are from Organic Farming. Smooth generously over your skin, giving extra thought to dry areas and breathe in the organic, essential oil fragrance blend. For a longer-lasting fragrance, apply after Sweet Blossom Shower Gel. SLS, Parabens, Synthetic Fragrance, Mineral Oil. Free from animal-derived ingredients. Suitable for vegetarians and vegans.